Today’s card isn’t a genius new idea – but I wanted to play with this Gerda Steiner gopher, and my inktense pencils came along for the ride! Any kind of critter works in a fun little card like this. It’s not a rocket science idea, but sure does pack a smile with it for whoever opens up the envelope! Watch the video below or click HERE to see it in HD on YouTube. 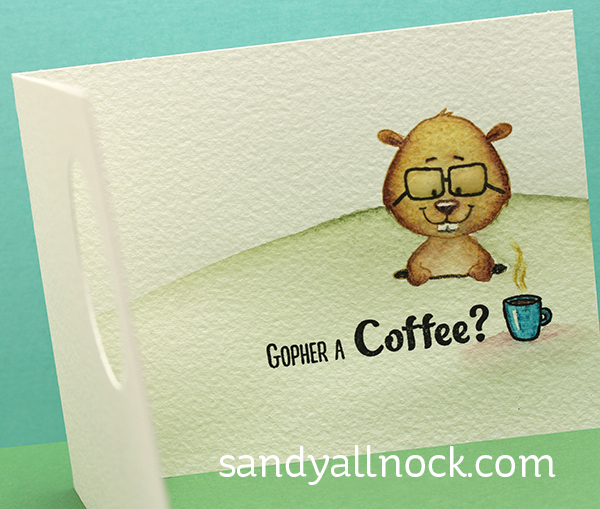 Here’s a view of the inside….I didn’t know gophers liked coffee, did you? Love your cute card. Thanks for your coloring video. Super cute! Thanks for using the INKTENSE PENCILS – I went back and watched three older videos with them and feel totally motivated to get mine out now. Super CUTE peekaboo card, thanks for the video! I didn’t know they liked coffee either but its pretty darned cute either way! Always love your videos. You make it look so easy. Thanks for sharing. Totally love to watch you paint – again and again! I love a good pun! Great card Sandy! So cute. Love 5he glasses. He looks so intelligent.